Belize is one of the last unspoiled places on earth. Still undiscovered, often mis-located and usually misspelled… this is a fantastic country, and you DON’T want to miss it. Tucked into a forgotten corner of the Caribbean, Belize has remained apart from the growth of the rest of the region. Belize offers travelers the richly rewarding authenticity they seek in a Caribbean getaway. Belize is in Central America, and it harbors the region’s last unspoiled marine and rainforest environments. With direct, inexpensive flights from the U.S. and Canada, this tropical paradise shares borders with Mexico and Guatemala. It’s a breeze for American’s to travel around Belize, because English is the official language, and US dollars are accepted throughout the country. 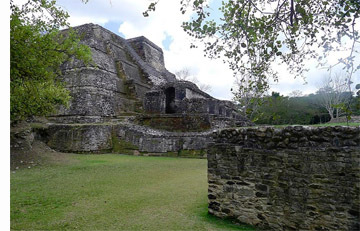 Belize offers a land rich in natural beauty and steeped in the history and culture of its Maya past. Renowned for having the second largest barrier reef in the world, Belize’s pristine waters, exotic marine and wildlife, hidden Mayan ruins, and superb adventure sport locations insure that Belize offers some of the most exciting adventure travel opportunities available anywhere. There are enough incredible places to explore to keep you coming back for years to come! 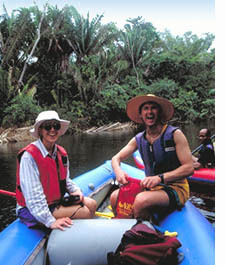 Visit our Things to Do in Belize page to see our recommendations. The first thing you need to remember when visiting Belize is: DON’T WORRY, BE HAPPY!! Traveling in Central America can be wonderful, relaxing, frustrating, exciting, or dilatory. Of course, much of what happens is out of your control, but your reaction to events can make a world of difference. Just remember that everything always works out fine in the end, and if you are like our past guests, your trip to Belize will be the best vacation of your life! Just take a deep breath, slow down, and keep smiling! We have to remind ourselves this all of the time. It’s a different latitude with different attitudes. The mix of ethnic groups in Belize has created a very diverse society, but culturally it is based on the country’s long history of English rule. As such, the most favorite diet is English based, the language is English, and the government and constitution mirrors a mix of English and US structure. Although the majority of the population is black and retain political control of the government, all the various ethnic groups get along even though they strive to maintain their independent traditions. Climate: Belize enjoys a subtropical climate, somewhat similar to that of South Florida, with temperatures typically in the 70s to mid-90s. There is a “wet” and a “dry” season, with the dry season lasting approximately from late November through May. Rainstorms can occur during the dry season, but they are usually brief. Hurricanes are a potential threat from July to early November. 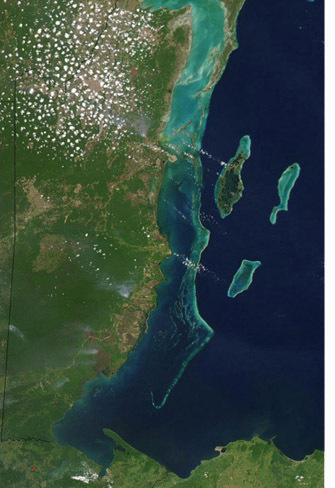 The worst in recent memory was Hurricane Iris, which struck Placencia in southern Belize in October 2002. Capital: Although the capital city is Belmopan, the largest city in the country is Belize City, with a population of about 70,000. The capital was moved from Belize City to Belmopan in 1965 as a result of Hurricane Hattie which wiped out much of the northern coast where Belize City is located. Government: Belize was known as British Honduras until 1973, and they gained their independence from Britain in 1981. They have a parliamentary, two-party democracy. Time zone: Belize is on Central Time but does not observe Daylight Savings Time. Health: The water is safe to drink in most areas, and the standard of health care is among the highest in Central America. Tourism: Despite what you may have heard, Belize remains a little-visited country; the number of international visitors to Belize is about one-half the number that visits Costa Rica. Cancun alone gets four times the annual number of visitors to all of Belize. Only about 35% of Belizean visitors are from the United States and over half of the tourists go to either Ambergris Caye or Caye Caulker. The next most-popular destination is the Cayo District, the area around San Ignacio. Belize has many locations where tourists can really get away from it all. Geography: Belize is renowned for its diverse geography, all compacted into a relatively small country. Virgin rainforests cover much of the interior mountains, and wildlife is prolific in these protected areas. The Maya Mountains, which cover the southern half of Belize, rise to over 4,000’ from the coastal plain, and provide a dramatic backdrop to the nearby Caribbean Sea. The northern region and coastal plains are covered in a savannah type vegetation, and see rainfall amounts less than half of what the southern mountains get. Most of these areas have been converted to agriculture and are populated, although close to the coast the swampy terrain has been left wild. The best known geographical feature of Belize is the barrier reef and its scattered islands, as well as three atolls found outside the reef. Prolific coral formations support a rich tropical marine ecology, and marine live is abundant. The islands are mostly idyllic, palm covered specks of sand, and many have been developed as tourist destinations. However, the majority of these islands are swampy, mangrove covered refuges for wildlife, such as salt water crocodiles, manatees, and serve as important breeding grounds for many fish species. For a detailed map of Belize which includes most of the islands, visit our web site. National parks: Belize has been a leader in Central America in creating national parks to preserve its many natural resources. Huge forest reserves cover the Maya Mountain region, and national parks are scattered throughout the accessible jungle areas that contain natural features such as caves, waterfalls, and virgin stands of timber. However, the real jewels of Belize are found along its barrier reef, and many national parks and marine reserves have been established along the reef to protect the underwater resources found there. Belize has become famous for its efforts to protect these natural wonders, and many have been declared UNESCO World Heritage sites. The economy of Belize is based on agriculture (sugar, aquaculture, fruit plantations), but tourism has been steadily growing as an economic force in expanding the economy. Oil exploration has recently paid off and Belize is now exporting small quantities of oil. However, since Belize is unable to export as much as it needs to import, the imbalance of trade has created financial strains on the government, and as a result it has to levy very high taxes on businesses and imports, which has hurt the population and creates widespread poverty and chronic unemployment. As a result, there is a large emigration rate out of the country. Transportation: Belize has four major highways, the Northern Highway connecting Belize City with Chetumal on the Mexican Border, the Western Highway connecting Belize City with Belmopan and continuing to the border with Guatemala, the Southern Highway linking the Stann Creek and Toledo Districts and the Hummingbird Highway linking Western Belize with the Stann Creek district. All principal towns and villages are linked by roads to Belmopan and Belize City. Regular bus services operate to and from all main towns. Two airlines service in-country flights in Belize. Visit our Belize page on our website to find links to their websites. There are daily flights between Belize International Airport, Belize Municipal Airport, Dangriga, Placencia, Big Creek, Punta Gorda, Corozol, Caye Caulker, Caye Chapel, Ambergris Caye, Flores, Guatemala, and Cancun, Mexico. Sample rates: Belize International Airport to Dangriga: one way: $54. For a list of airlines to Belize, visit our Flying to Belize page.